The other day I was perusing the beer isle at Binny's, looking for nothing specific but wanting something to enjoy while being pounded by another winter storm that was on its way. Over the last decade or so, the craft beer market has exploded, offering all sorts of choices from every corner of the country and the isle at Binny's stretched the entire wall. It was a dark evening, with only a sliver of moon hanging in the sky. At times it was difficult to discern where the land and water ended and the sky began. Lonely lights from isolated farmhouses, almost indistinguishable from the stars in the sky, spotted the landscape. It was so dark on the river Robert wondered how the captain could even maneuver such a large vessel without running aground or hitting a fallen tree. In the writing of Lilac Wine, I have tried hard to root the narrative in actual history. Pouring over hundreds of issues of the Dubuque Telegraph-Herald in order to get a sense of life in that corner of the country in the summer of 1917, the characters interact with actual businesses and products from the time. Abelia, for example, orders her music from the Dubuque Music House, which was located 1362 Clay Street. When traveling to Dubuque, she shops at the largest department store in the city: Roshek Brothers. The department store was such a staple of the city, the ads, which appeared daily in the Telegraph-Herald, didn't even display the address. All it stated was "Located in the heart of the city." Billy and Robert take an excursion on the popular steamboat Sidney, which made regular trips in and around the Dubuque area. 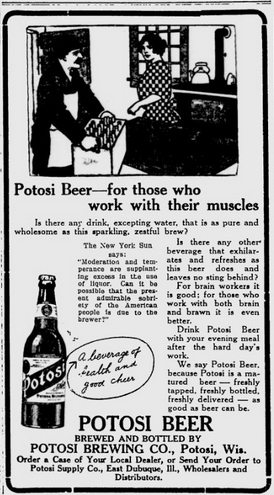 And there they ordered some Potosi beer, the "beverage of good health and cheer." Potosi Brewing Company was founded in the small mining town of Potosi, located in Wisconsin some 15 miles directly north of Dubuque. 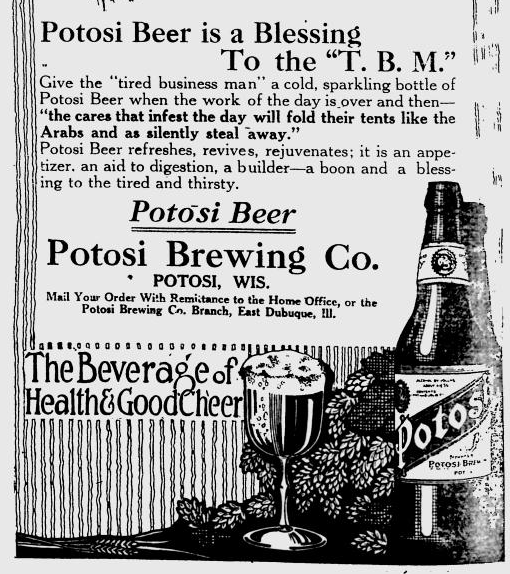 Although a brewery had existed there since the mid-19th century, it didn't become Potosi Brewing Company until 1906. Soon it was one of the largest breweries in the area, selling its brew in more than five states. 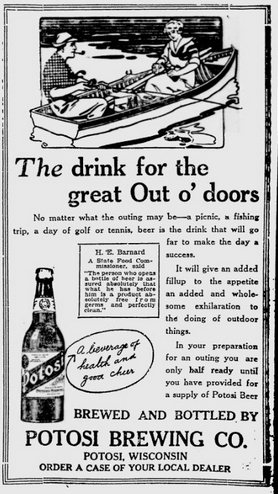 Potosi Brewing Compnay often advertised in the Dubuque paper, particularly in the years prior to the state going dry in 1916. 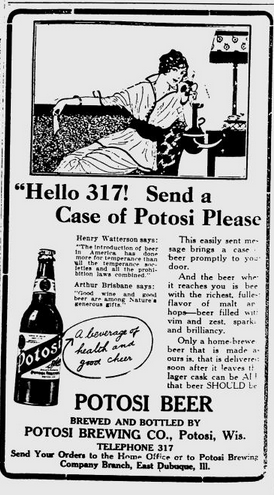 The Potosi Brewing Company survived national prohibition by making "near beer" and adding a dairy to the operations. They continued thriving until the 1960s, when access and exposure to the larger breweries increased due to the automation in those plants. 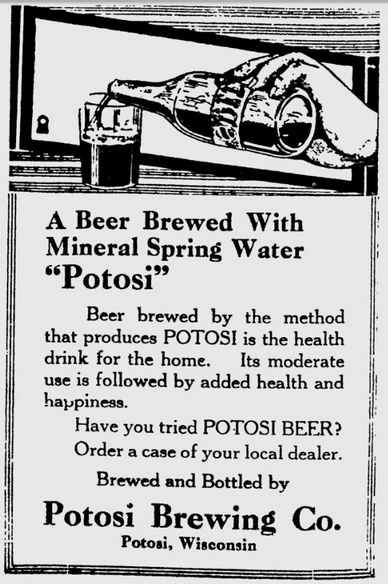 Smaller breweries, like Potosi, had difficulties competing. Potosi Brewing Company closed its doors in the early 70s and soon the brewery and its buildings fell into disrepair. The brewery was purchased in 1995 and efforts began to restore it. The National Brewing Museum chose Potosi as its headquarters in 2004. Today, the brewery is owned by the non-profit Potosi Foundation and all profits from the beer are given to charity. I purchased the Pilsner and brought it home. Now, I have to admit: I am a beer snob. Life is too short to waste on crappy beer. And, let me say, I have had plenty of crappy beer, including ones that I have made myself. As I poured the Potosi, my thoughts turned to Robert and Billy, throwing back a few on the Sidney, the sound of jazz from the deck below filling the air. Robert Bishop was from Chicago and that night in the summer of 1917 on the steamer Sidney was his first taste of Potosi beer. As I picked up the glass, I felt a twinge of nostalgia. That's the thing about writing a novel. You become so invested in the characters, their experiences and the world you have created that it transforms into something very real. Here I was, drinking a brew that almost 100 years ago was consumed by my characters in the fictional world of Lilac Wine. Until today, I believed that Potosi beer was a relic of the past. A small thing like this becomes a nostalgic experience, allowing you to live for a moment through characters created in the depths of your imagination. It's really hard to explain the feeling. The beer was a bright golden hue with a faint aroma of grain. It was surprisingly good, crisp on the tongue. Not hoppy like other Pilsners, this was markedly smooth, perfect for those who are not too fond of hops. To be honest, it reminded me of summer--and with the winter we have had so far, it was a welcomed thought. 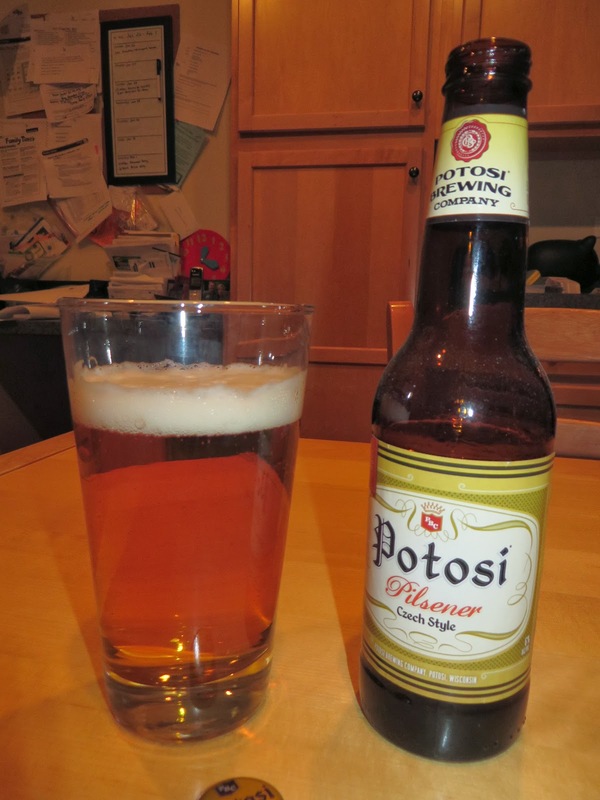 For more information about the Potosi Brewing Company, check out their website. Have you tried the Potosi Steamboat Shandy? It's a summer seasonal, named after Potosi's famous Steamboat that used to carry beer up and down the Mississippi River, just as you have described above in your novel. It should be available at Binny's now, if not be sure to ask! :) Cheers!